Along with the new Fangtastic Fun items that have been launched in the FarmVille 2 marketplace this week comes the arrival of a cute little witch bunny that we can now adopt on our farms. 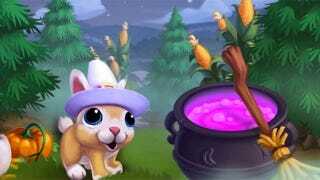 The Witch Bunny is released via the "Bunny's Brew" quest, which sees you building a Cauldron on your farm. We're here with a complete look at this cauldron feature, thanks to Zynga. The Witch's Cauldron can be placed from the store for free. Once you place it, you'll need to collect eight Wood Planks, eight Metals and eight Bubbling Brews to complete it. All three of these can be earned by asking your friends to send them to you. After you've gathered those, you'll also need to ask four friends to come be workers within the building project to actually finish the Cauldron. For the final task in this quest, you'll need to ask your friends to send you Enchanted Carrots via a general news post placed on your wall. If you want to finish this fast, play on Zynga.com so that you can earn the help of random friends as well as those you actually know. If you ever need to access this quest's window after you close it (say, to ask for more Carrots), you'll need to find the Witch Bunny hopping around on your farm and click on it, as this quest doesn't show up on the left side of your farm. There are three associated Witch Bunny quests that are also available to complete, but we'll bring you a complete guide to finishing those as soon as we know more.